With HMRC’s ‘Making Tax Digital’ initiative launching in April 2019, have you thought about how you will handle with your employee expenses and accounting records? Accountants no longer want to deal with piles of paper, receipts and claim forms and with the majority of receipts still paper, this is a problem for accounts teams who will have to manage the transition. Even if you’re not one of the VAT registered businesses who will need to comply straight away, it’s a good idea to explore your options for making your employee expenses and accounting records digital and getting ahead of the game. We are experts in taking the chaos of unstructured paper documents and creating digital files, organised filing structures, streamlined processes, and generally restoring order and control to your business documents. Here are our 5 steps for digitising your accounting documents. 1. Identify which types of documents you need to give to your accountant to complete your tax return e.g. invoices, expense receipts, expense claim forms, spreadsheets etc..
2. Identify what format each of the required documents arrives in the business as – paper or digital. 3. All documents that arrive in the business in a digital format, should stay digital. Stop printing them out and then manually typing the data back into to your in house systems! All documents that arrive in the business as paper (and we’ll bet there aren’t as many as you think) need to be digitised. Most business documents start life as digital files, e.g. as Word or Excel files. So, if your suppliers are sending you paper invoices, POs etc, tell them you only want to deal with digital files in 2019. 4. Now you have identified which paper documents you will need to digitise, what is the best way to do it? There are 2 main ways – Scanning and OCR, and using a mobile capture app. There are two things you need to do to digitise your paper documents. B – Use Optical Character Recognition (OCR) technology to convert the image into editable and searchable data, allowing you to easily access, edit and search for the content of the original document. If you have a lot of paper documents, you might choose to outsource this step to an experienced company, or adopt a ‘phased’ approach where you scan and OCR documents as and when you use them. These work best with smaller paper documents like expense receipts. 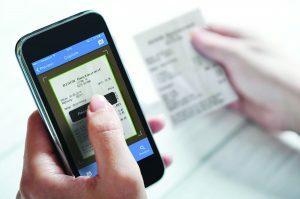 A mobile capture app works on android and iPhone devices and allows you to take a photo of a receipt and upload it to a cloud account. Smart image settings within the app will ensure that you capture the best possible image of your receipt. You can then add additional information such as the date, amount, currency and expense type and upload all the information to your account. This can all be done on-the-go. On a train, at the airport, in a restaurant or hotel – anywhere. You have just digitised your receipt and can now throw the paper one away. At a convenient time, you can log in to your account, complete your expense claim and submit it to the accounts team. This is compliant with regulations for storing financial records. Now that you have digitised your paper documents and asked suppliers to only send you digital files in future, what is the best way to store them so that they are secure and easy to retrieve when you need them? It’s important to note that many Accounting systems only store a link to your digital files, and not the actual files themselves, making it difficult to quickly access and view the file you require. We would suggest storing your digital files securely in a Document Management system. This is a central repository where all files can be stored with indexes for easy searching and retrieval. There are so many ways that you can search for a document, you can find what you’re looking for in seconds. Essential when you need to compile all of the documents required by your accountant. You can easily export the files you need in a format that your accountant/HMRC can work with. You can also set up ‘watched folders’, portals, and monitored email addresses – to automatically get or ‘capture’ the digital files, extract the information in them and file them in the right digital location. This kind of intelligent workflow saves your Accounts team so much time, reduces data entry, improves accuracy, and reduces stationery costs because you’re not printing out files. There are more benefits to a Document Management system. You can set permissions for every file so that you have complete control over who is allowed to view and edit them, extremely important when dealing with sensitive banking details. Every action is recorded in an audit trail so you can see who has performed what action on which file. This gives you transparency, accountability, and a clear view of what is going on in your business. If you’re ready to start digitising your business and accounting documents, let’s talk. Call us on 01285 810606 or email jack.wright@yourdms.net and find out how we can help.